From Pre-love to New Love! Whilst we celebrate all things National Op Shop Week …here’s 7 Easy Ways to Rework Thrift. Remember the 7 R’s – Reimagine, Reinvent, Rediscover, Revive, Restyle, Revolutionize, Ressurect. 1.Reimagine – Op Shops offer a world of style possibilities, the only limit is our imagination. So when I’m thrifting I always aim to think outside the square and dream up ways I can recreate the trends. Take the big bum bag/fanny pack obsession, the designer versions are a serious spend so why not save your cash, support the planet and create your own. For my D&G version you see here – I used a faux Dolce wallet, plain stretchy belt and feather bag charm I found – for under $10 bucks. Then all I did was glue gun the wallet to the belt and add the charm to the side. Hey presto preloved chic. 2.Reinvent – If it’s good enough for Madonna then why not adopt the reinvention ethos for yourself. I believe we should give our wardrobes a workout and look for ways that we can rework what we already have. I’ve been known to wear a blazer as a bustier (check out the pic below) turn scarves into asymmetrical panels under belts and over jeans, even wear scrap fabric embellished with sparkle as a top. Be inspired by the trends but don’t feel pressured to pay up – op shopping allows you to play. 3.Rediscover – Accessories are amazing, a fool proof way to easily transform your op shop finds in an instant! Belts, bangles, blingy necklaces and my absolute fave – vintage brooches. They don’t have to be destined to a life as a one purpose pin, I put them everywhere possible! Inspired by the Gucci fanny pack encrusted with gold hard wear, I pinned a cluster of vintage brooches in the same formation onto a $2 patent toiletry bag attached to a belt! To recreate McQueen – I embellished a corset with an insane amount of brooches to get a similar look. Every time I go into an op shop I will buy a brooch to add to my collection – they are just such useful little buggers! 4.Revive – Breathe new life into a basic piece with clever customising. Cowboy vibes are a big trend we’ve just seem strutt down the fashion week runways, so I headed to my local craft store to get my Clint Eastwood on. This white tassle trim cost me about 5 bucks then I simply stitched it to the bottom of the blouse. Like the brooches, why not build up a little craft kit filled with ribbons, buttons, embellishment, interesting trims and trinkets. Whenever you think you don’t have anything to wear try reviving. Let make do and mend-ism be your muse! 5.Restyle – Spring Racing is upon us but it can be such a wasteful, wear once sartorial affair. You will absolutely look just as chic as all the fast fashion filly’s in fact, you’ll be more fabulous because your outfit has a story. 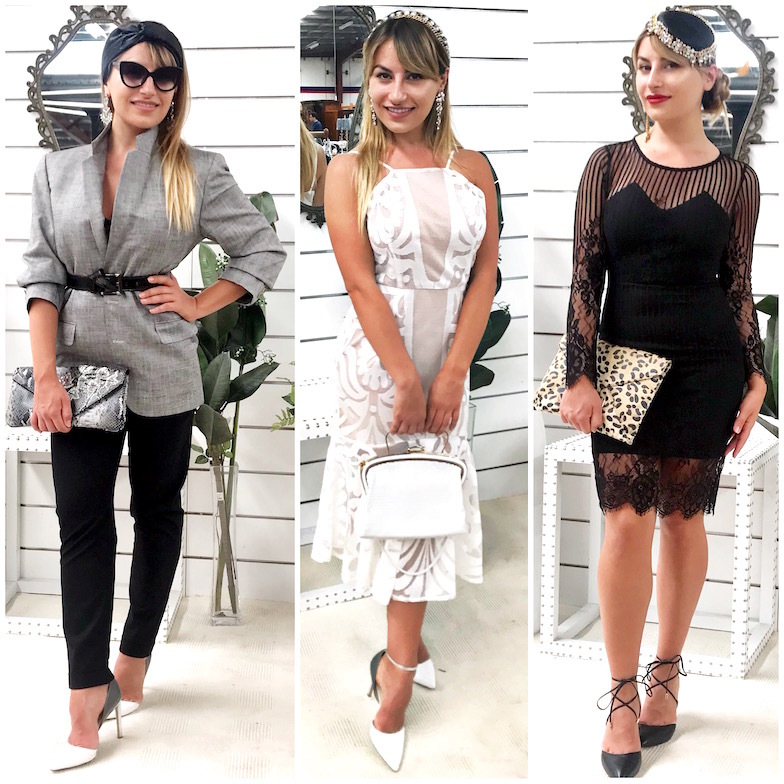 This trio shot is 3 outfits I sourced and styled from Salvos Stores and shows you that you never ever have to sacrifice style. Don’t just go for the standard dress either, my fave look is the pants teamed with a men’s jacket and scrap material turned into a stylish turban, simply by twisting it. The other two hats I customised as well, using broken jewels and brooches. Run your own style race sista! 6. Revolutionize – Be a change maker, shift the fashion mindset and stand for style with a purpose. When I was living overseas op shopping was genuinely all I could afford so I challenged myself to recreate luxurious designer looks I saw in the pages of Vogue for minimal spend. Whilst it initially just helped me feel good about myself I quickly realised I could be of service on a much bigger level. To this day second hand is still my first choice. I am so passionate about showing you that op shopping can absolutely be just as chic as high fashion, so whenever I can I love to DIY (sometimes with dressmakers and designers too) and really go to town on the recreation. This Maison Margiela Vs Salvos Stores offering for Fash Fest is one of my faves. From the decorations, to the family table settings and of course the style – you can find absolutely everything you need in an op shop and to top it off your fashion dollar does something really positive for the planet. You divert textile waste from landfill, support the mission of a charity and empower your local community. Thrifting is such a great option for all the events we have at this time of year – check out my Today Show segment and why not plan a Merry THRIFT-mas for 2018!.